Last week it dawned on me that we were about to begin a multi-day cycling adventure in the foothills of the Austrian Alps, and I hadn’t been training for it. It felt like that nightmare where you walk in for the big test and suddenly realize that you forgot to study. So I decided to do a training ride and at the same time find out how far I could go. Get the bad news out in the open, so to speak. Find my pain point. The adventure started at Cecil Moses park on the Duwamish River, as do so many of our rides. 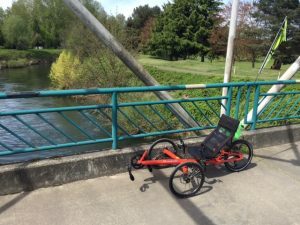 I headed south on the trail, following the Duwamish as it transitioned to the Green River, through Dockton, Tukwila (and the ever-popular Osprey nest on a pole), then Kent, Auburn, and through the farm fields and duck ponds on the Interurban Trail. And finally, my reward: lunch at Coco Joe’s, homey bar and grill with the best burgers and French dips in the valley. Then it was back up the Interurban through downtown Kent, past the industrial district, through Fort Dent park, and finally back to Cecil Moses. I added it all up and it came to…50 miles! Now, all winter the longest ride we have taken has been 25 miles, so after doing double that with no gradual ramp up, I felt like I had been on a…pleasant sightseeing ride in the sun. This is the beauty of the trike: no suffering. I didn’t set any speed records, but there was no need to. I never had the feeling that if I didn’t get off that saddle soon I was going to die in pain. I just kept rolling along, looking at the surroundings, enjoying the sun, watching the birds, greeting passing cyclists and walkers. The longest day planned in Austria is shorter than my ride last week, so I think I’m about ready. First though, I have to pick up a trike. Later this week I leave for the Azub factory in Uhersky Brod, in the Czech Republic. There’s a green Tricon waiting for me there, a display model from the Spezi special cycle tradeshow in Germany last week. More about that as it develops.